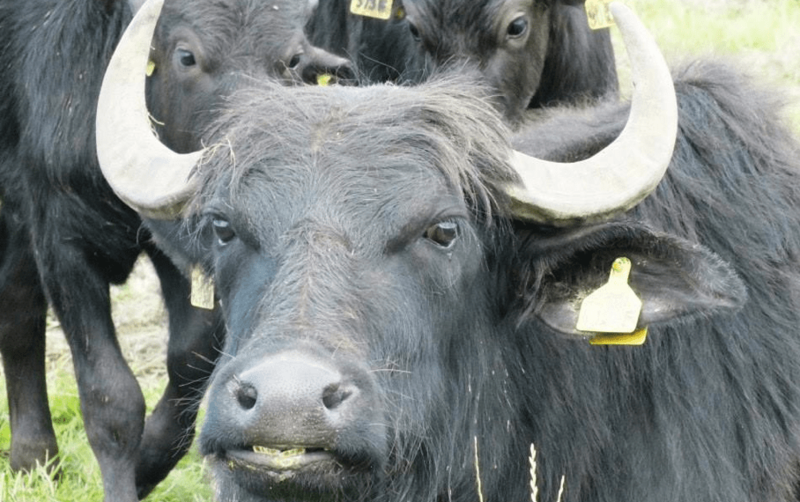 Schoolhouse Farm, in Deerness is the home of the Bremner family who produce lean and tasty buffalo meat and in August 2013 they welcomed their new herd of Asian water buffalo to the shores of Orkney. Buffalo are a triple purpose animal, producing milk, meat and draught power. Generally considered docile and easy to handle, they are slow growing, taking about two years to reach maturity and can live well into their 20s. the ability to convert grass fodder into meat or milk without the need for any other supplementary feed or inoculations. This produces a pure, very healthy and tasty meat, with a natural tenderness. Buffalo meat is low in cholesterol and high in mineral content with less than half the total fat content of conventional lean beef. The meat tastes a little richer and sweeter than beef, the fillet is very good. Buffalo milk has 58% more calcium, 40% more protein and 43% less cholesterol than cow’s milk. School House Farm are now selling buffalo meat at the Kirkwall farmers market and will be there this Sunday for their Christmas sale, and then the last Saturday of each month thereafter. Russell and Naomi Bremner have lots of ideas in the pipeline, including milking some of the buffalo cows, curing some of the meat, and creating opportunities for people to visit the buffalo on the farm. The Orkney Buffalo website is packed with lots of information about the animals and their products as well as some great recipes and details of the farm’s ancient breed of Jacob sheep. We couldn’t resist including their video of a newly born buffalo calf.